Widely known as a “Father of the Internet,” Cerf is the co-designer of the TCP/IP protocols and the architecture of the Internet. In December 1997, President Bill Clinton presented the U.S. National Medal of Technology to Cerf and his colleague, Robert E. Kahn, for founding and developing the Internet. 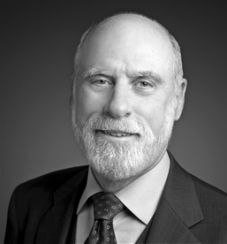 In 2004, Cerf was the recipient of the ACM Alan M. Turing award (sometimes called the “Nobel Prize of Computer Science”) and in 2005 he was given the Presidential Medal of Freedom by President George Bush. Cerf began his work at the United States Department of Defense Advanced Research Projects Agency (DARPA) playing a key role in leading the development of Internet and Internet-related data packet and security technologies. Since 2005, he has served as vice president and chief Internet evangelist for Google. In this role, he is responsible for identifying new enabling technologies to support the development of advanced, Internet-based products and services. He is also an active public face for Google in the Internet world. He also served from 2000-2007 as chairman of the board of the Internet Corporation for Assigned Names and Numbers (ICANN), an organization he helped form. Cerf served as founding president of the Internet Society from 1992-1995, and in 1999 served a term as Chairman of the Board.